More background info: Stutthof, or Sztutowo in Polish, is one of the lesser known sites of the many concentration camps that Germany's Nazis established between their rise to power in 1933 and the end of World War II. 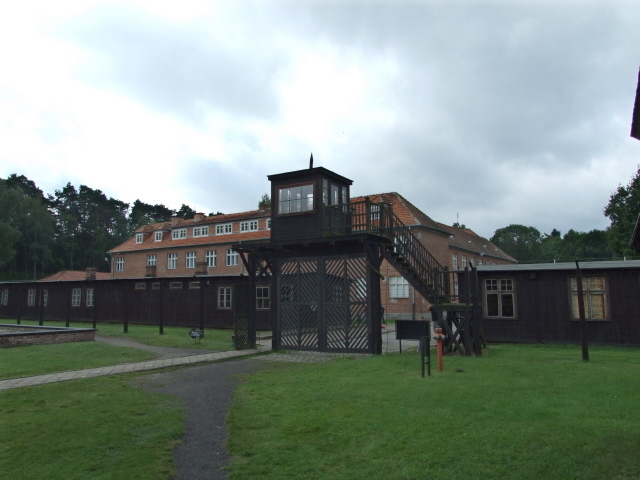 Stutthof's initial role was to serve as an internment centre for "undesirable" Poles (i.e. members of the political opposition, intellectuals, etc.) right from the start of the war, which began in Danzig/Gdansk. Lists of persons who were to be removed from society once the war was under way had been drawn up beforehand, and so the initial camp quickly filled up. 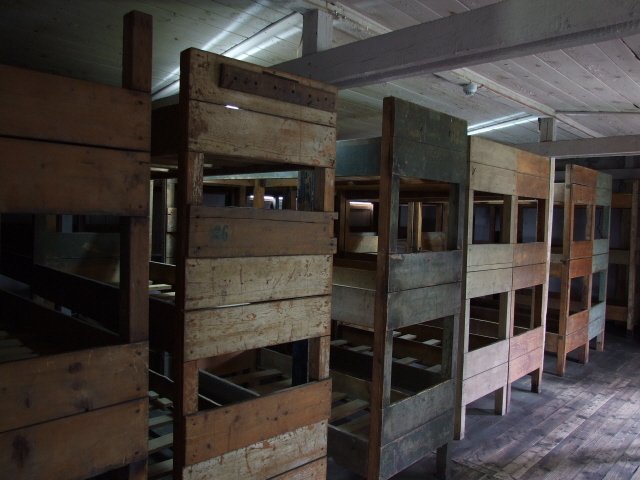 From 1942 onwards the camp also assumed the full role of a concentration camp, with inmates now including POWs and Jews from various other countries too. 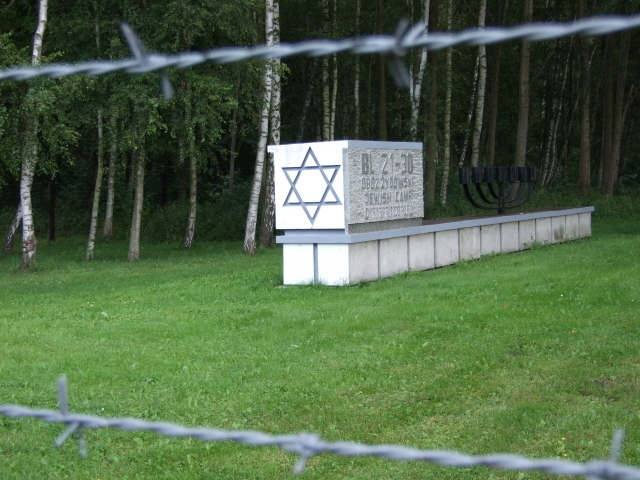 During this time the camp had been expanded, including the addition of a dedicated Jewish section, the "Judenlager". Towards the end of 1944 Jews formed by far the majority of the inmates. 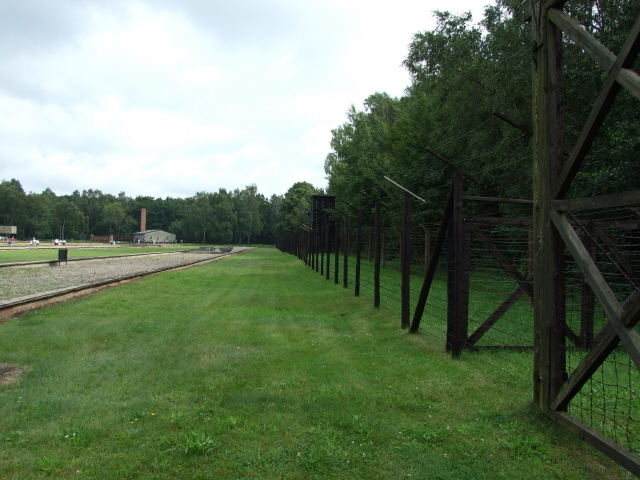 Thus this camp too played its part in the Holocaust, even though nowhere near as massive a role as other sites in Poland, especially Auschwitz. A total of ca. 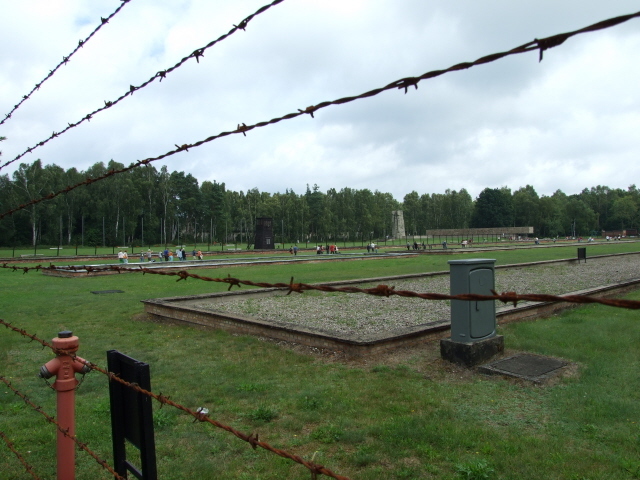 110,000 people passed through this camp and well over half of them, possibly as many as two-thirds, perished here, including almost all of the Jewish inmates. Yet more died on the Death Marches just before the camp's liberation by the Soviet Red Army on 9 May 1945. 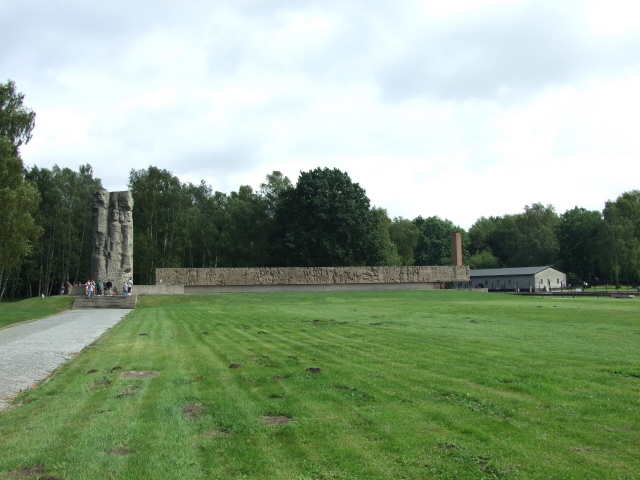 It is noteworthy that the camp stands out in that it existed for the entire duration of WWII, from day one to the day of Germany's capitulation. 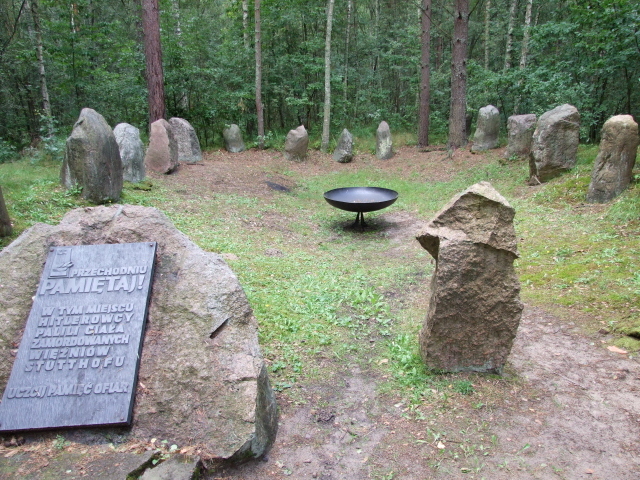 Only then did the Red Army take Stutthof, as the very last camp to be liberated. Inside they found a mere handful of just over 100 inmates still alive. The causes of death were mainly attributable to the usual regime of inhumane living conditions and forced labour – called "extermination through labour" ('Vernichtung durch Arbeit') in Nazi bureaucratese. This already claimed many lives but was also further augmented by direct murder (shootings, lethal injections, etc. etc.). 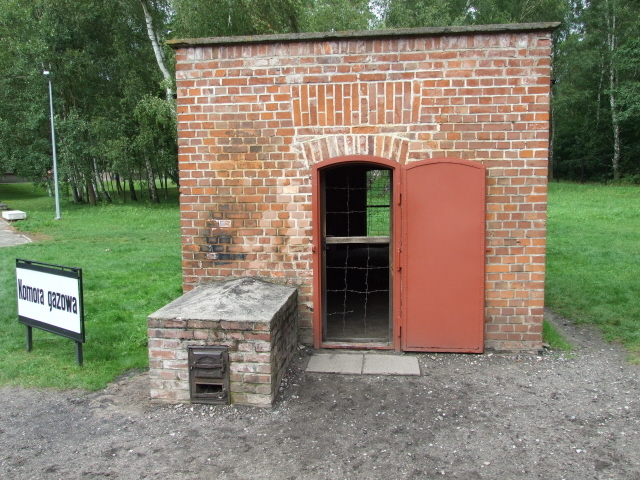 From mid-1943 the camp also had a gas chamber, initially for disinfecting clothes, but it is estimated that over 1000 inmates were gassed here with Zyklon B too. Next to the gas chamber there's a crematorium, and a bit outside the camp proper there was also a pyre for cremating corpses. Today's memorial comprises a huge monument set in the grounds as well as a range of remaining original buildings, some of which house extensive exhibitions. The camp's location is somewhat unusual. It is close to the Baltic Sea – which is a major tourist draw, in particular in summer. The holiday centre of Krynica Morska is close by. And it seems that Stutthof provides a kind of distraction from the beach for holidaying Poles (especially on a dull day). When I went in August 2008 the place was absolutely rammed, mostly with Polish families. Including young children! Now, that is really very unusual for such a site! 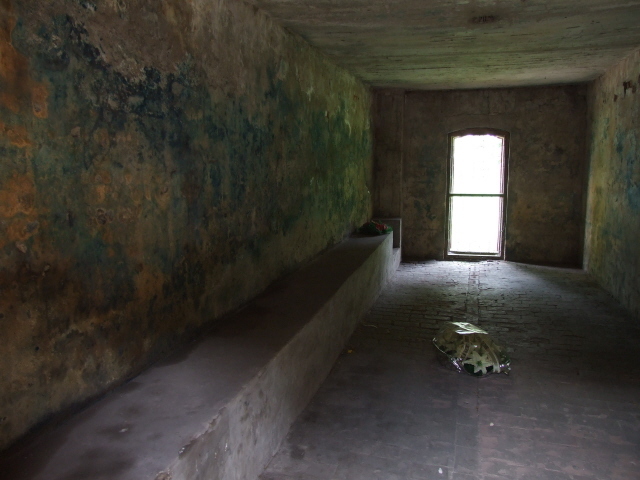 Most former concentration camp memorials have an age restriction, usually no under 14-year-olds are allowed in. 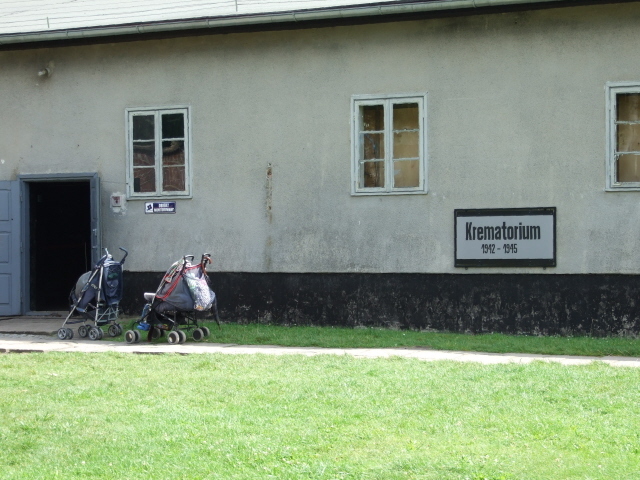 At Stutthof (despite what is claimed on their website) the rules are apparently more lax: there is a sign at the entrance that states: "no under 13-year-olds unless accompanied by an adult" but that is evidently not policed. And while dogs, bicycles and bathing costumes are forbidden outright (although the latter isn't strictly enforced either), kiddie buggies and prams are OK, it seems. There was the strangely incongruous atmosphere of a family fete about. It was thus indeed a very odd sight to see kiddie buggies parked outside the crematorium, or to see toddlers frolicking about in between the camp's watchtowers, barracks and grim monuments. Parents even took their offspring into the exhibitions – and these include some truly gruesome images of heaps of corpses and the like. You have to wonder: what do parents say when little 7-year-old Adam asks: "Mummy, why are there piles of people lying on the ground with no clothes on and why are they all so skinny?" Even without the kiddie element, adult visitor behaviour left a lot to be desired too. Some simply don't seem to get the sombre significance of the place. People posed grinning for photographs next to the gallows, the gas chambers, the crematorium … I even saw a mother making her daughter pose for a snapshot in front of the cremation pyre site in the woods by the camp. The daughter looked a bit uncomfortable about it but did what she was told to do. The mother, on the other hand, didn't seem to care one bit whether or not this was appropriate. What do these people say when they show friends or relatives these photos? "And this is little Julia in front of the place where a few thousand murdered Jews were cremated"?!? I just can't get my head round this kind of disrespectful tourist behaviour at sites such as this. How can you possibly so mistake it for a kind of Disneyland holiday entertainment facility? It's beyond me. What there is to see: The approach road to the site's car park passes the commandant's villa and a few other buildings not accessible to the public. Nor is the large brick administrative building dominating the front part of the complex – except for the cinema where various documentaries about the camp are shown (at regular intervals during the high season, only on demand in the low season). 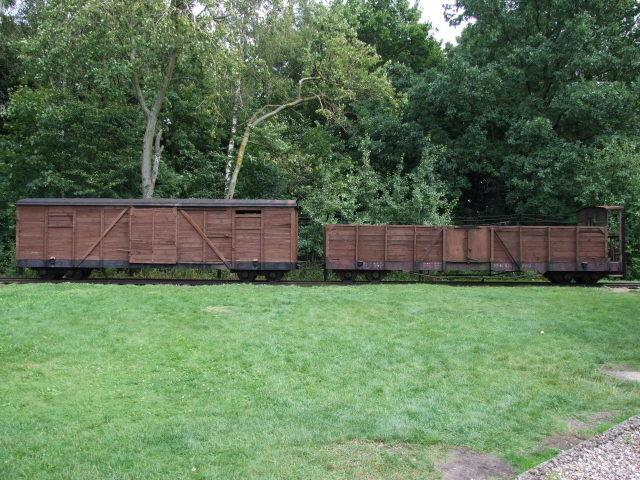 Closer to the camp's main gate – referred to as the "Death Gate" – there are two huts containing exhibitions. One houses a heap of old shoes taken from the inmates – a "classic" concentration camp memorial exhibit found in similar forms also at e.g. 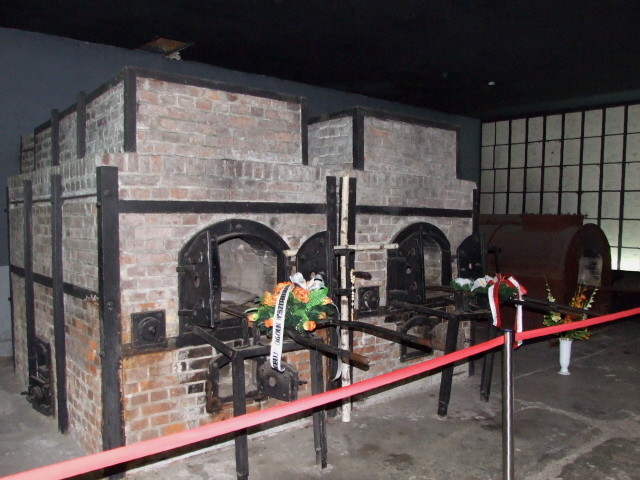 Majdanek and Auschwitz 1. Furthermore old photos and documents are on display too, including a section dedicated especially to victims from the Polish Catholic Church. The other wooden hut housed a (presumably) temporary exhibition of artwork relating to the theme of persecution, refugees past and present but also nuclear dangers (e.g. one poster dealt with Chernobyl). In addition there were reconstructed cells and instruments of punishment, such as the infamous "sawhorse" for beatings. 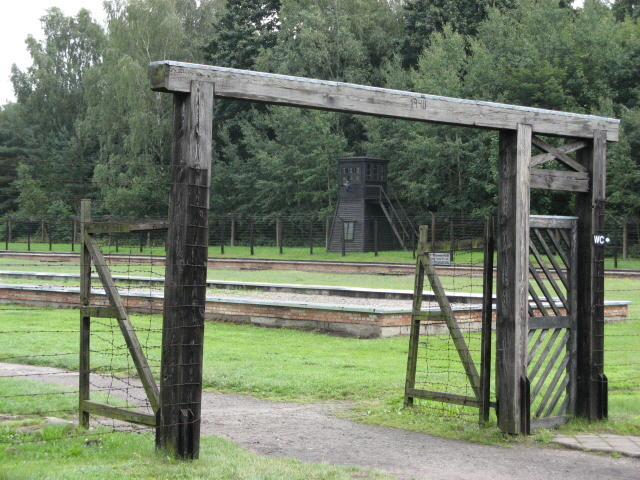 The circuit then leads through the "Death Gate" and takes visitors into the oldest part of the camp. This is fenced in and ringed by watchtowers, some preserved, some reconstructed. Inside the camp area there are more huts containing various exhibitions. 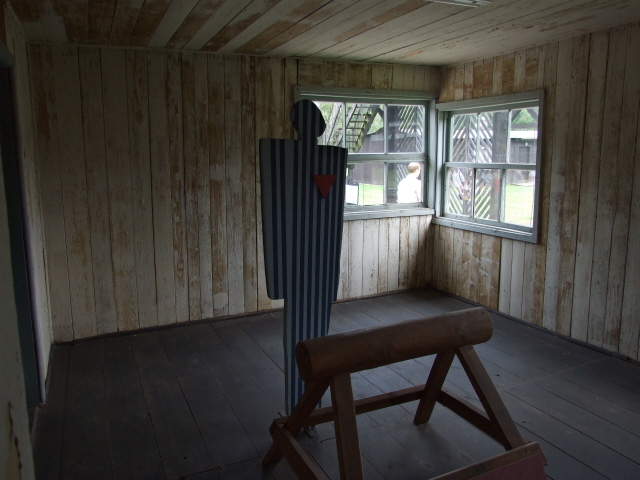 The one to the right chronicles the history of the camp as well as its administrative structure, complemented by a large mock-up model of the camp as it would have looked in 1944. In this section, explanatory texts are available in three languages (Polish, German and English), whereas most other parts of the exhibitions tend to be in Polish only! The hut opposite was the former "women's block". It now mainly houses an exhibition about life in the camp, complete with sleeping quarters, eating tables, washrooms. 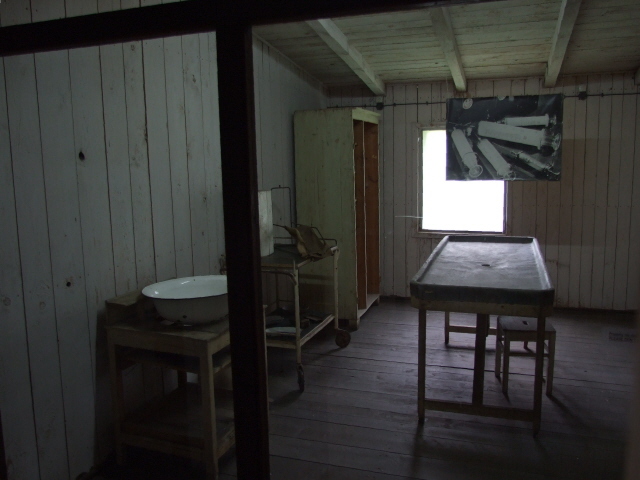 Also to be seen are parts of the "hospital room", including an operating table used when administering lethal injections. Apart from the artefacts which more or less speak for themselves, there are also documents, photos and maps, etc. – some of these remain a bit obscure without an English translation. After leaving the exhibition huts you walk past the foundations of the other barracks, none of which survived – their walls were used as firewood after the war. At the far end of the camp's area you come to the crematorium building. In the main room there are three ovens – somewhat ironically a sign at the door admonishes: "no smoking"! 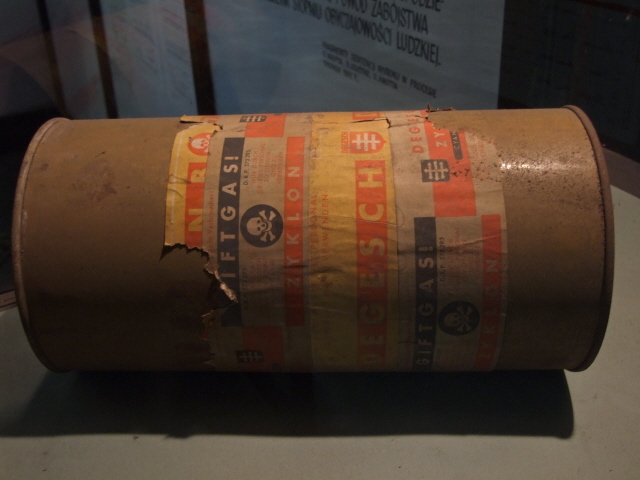 These are complemented with further permanent exhibitions about Stutthof's (partial) role as a death camp – and there's even a genuine Zyklon B gas canister on display. Another part of the exhibition chronicles the 'evacuation' of the camp and the Death Marches. Finally, a section is dedicated to the Stutthof trials against the perpetrators (which took place independently of the Nuremberg Trials). The circuit then leads past the enormous central concrete monument. It incorporates the ashes of cremated inmates ... visible behind glass panels. This monument forms the most prominent element of the whole complex. Back through the main gate, a path leads right past the later parts of the camp, of which, again, only the barracks' foundations remain. First you pass former kitchen buildings on the left and the site of the Jewish camp to the right, marked by a monument (nothing original remains of this part), and finally the path leads onwards into the woods. At the end of this path is the site of the cremation pyre, and a monument and plaque commemorating the victims. Back at the car park there's a small shop selling brochures, postcards and books. But otherwise there isn't as much commercialization as one might have feared given the odd bunch of beach tourists filling the site when I was there. All in all: Stutthof may not be the most important of the concentration camp memorials, but is fairly well laid out, if a little old-fashioned still, and in some places lacking multilingual accessibility for foreign visitors. Overall I would say it sits somewhere in the middle as far as the quality of such memorials within Poland is concerned. That means it may not be essential for everyone, but is still a very worthwhile day excursion destination from Gdansk or stopover en route somewhere else along the northern edge of Poland. Location: in the north of Poland, roughly halfway between the cities of Gdansk to the west and Elblag to the south-east, close to the Baltic Sea and its seaside resorts, such as Krynica Morska on the Mierzeja Wislana promontory. Access and costs: not too easy without your own means of transport, but free entry. Details: The only way to get to the camp by public transport is to take one of the buses from either Gdansk or Elblag that go to Krynica Morska. 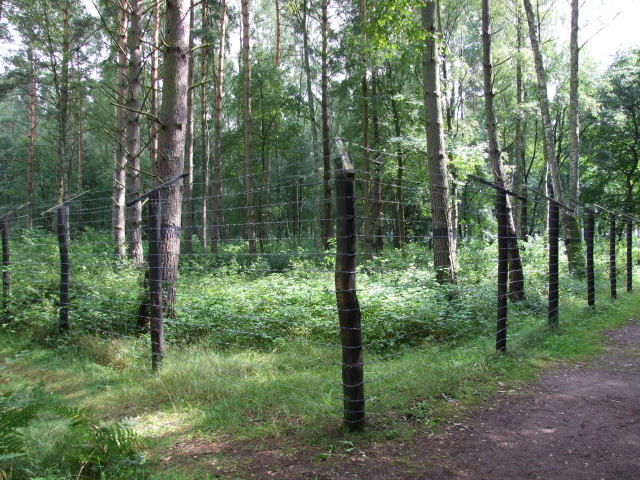 The route goes past the access road to the camp. Access is much easier by car: from Gdansk or Elblag: take the main road No. 7 to Nowy Dwor Gdanski ca. 20 miles (30 km) east of Gdanskor. 14 miles (22 km) west of Elblag; then turn off northbound onto the 502. At Rybina carry on straight (there's also a slower route signposted, but this is quite a detour through the marshes and gets you to the wrong end of Sztutowo). At Stegna turn right towards Sztutowo. The well-marked access road to the camp branches off to the left just before you get to the village. There's a large car park (which in high season can fill up, though) – parking fee: 6 zloty (in August 2008). Admission to the actual memorial site/museum is free. But there's a charge of 3 zloty for the cinema. Guided tours (lasting 2 hours) cost 140 zloty and are available in English, Russian and German (these have to be reserved in advance – see stutthof.pl). I also saw people carrying hand-held audio-guides of a quite sophisticated (PDA) type, which I presume must recently have been made available for hire. But tthere's no indication of this in the official brochures or on the museum's website, so I can't say anything about hire prices. Opening times: daily 8 a.m. to 6 p.m. (last admission 30 minutes before closing), from October to April closing time is 3 p.m. (note: open on Mondays, but no guided tours and no film showings). Time required: about two hours are recommended. This already implies a certain selectivity in viewing the exhibitions. Especially if you can actually read Polish too you can easily spend quite a bit longer here, reading all the texts provided. Factor in extra time for getting here in the high season, when traffic can get very heavy on the narrow roads in these parts. 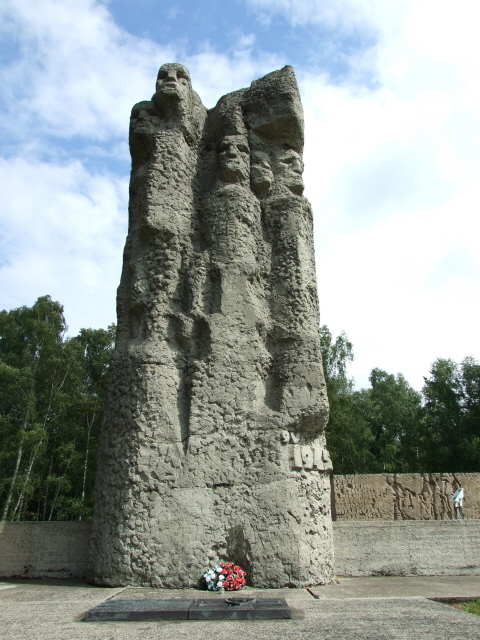 Combinations with other dark destinations: The closest obvious place to combine a visit to Stutthof with is Gdansk – which is well endowed with all manner of tourist infrastructure and thus makes the perfect base for exploring the area, including the day excursion to Stutthof. If driving onwards into north-eastern Poland from Gdansk via Stutthof, Gierloz with the Wolfschanze could be a good next stopover. It's about 200 miles (300 km) away, so an early start is advisable. Warsaw to the south-east can also be reached in a day – by all means of transport, railway being the most comfortable option. Combinations with non-dark destinations: Stutthof is very close to the Wisla promontory, which is a popular area of natural beauty, as well as a prime beach holiday destination. Beyond the Wisla lagoon lies Elblag,another city badly damaged in WWII, but with a partly reconstructed small centre worth a short stop. And north of that town is the Elblag plateau (Wysoczyzna Elblaska in Polish), which is a particularly scenic, though less well-known upland pocket of Poland. It's also here that Kadyny (Cadinen), the former German Kaiser's stud farm and stables, can be found. They are still in use. Parts of the buildings were converted into a country-club-style hotel (horse-back riding can also be arranged here). South of Elblag, there's the quirky tourist attraction of the Elblag canal, where boat cruises partly go overland! Boats are pulled up, or lowered down, on rails along slipways between sections with greater differences in elevation than simple locks could cover. It's quite a unique sight. And finally there's Gdansk, the city most popular with mainstream tourists in the whole of Poland (well, maybe after Krakow) and a must-see for anyone when in the north of this country.